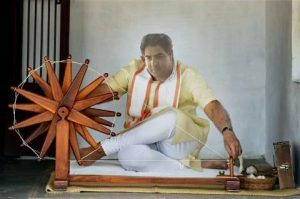 Srinagar: People’s Democratic Party (PDP) vice-president Sartaj Madni today released pictures of his son Aroot Madni spinning Khadi on a charkha to prove his credentials for the Khadi Village and Industries Board (KVIB) appointment. Junior Madni’s selection as an executive officer for the KVIB has created an uproar in the state but senior Madni said the picture proves how hard he had prepared for the job. A visibly angry senior Madni challenged media to bring one case where in candidate spun yarn on charkha. “Show me one candidate who had spun so many tales, sorry yarn, for the job. Even I have weave a lot of yarn to help him get the job,” senior Madni said. Lambasting the critics the PDP vice president said it was height of skepticism that people did not believe when PDP’s most honest face Khursheed Alam vouched for the integrity of selection. “Here in the picture you can clearly see Aroot jan spinning the Khadi yarn. He knew how much Charkha is important in Khadi Village Industries Board and insisted that he himself spins the yarn,” an emotional Madni said. He said that it breaks his heart to know that after spinning so much yarn his son had got disillusioned with the job.